What Are Those Big, Black and White Wasps? By Chris Williams on June 12, 2015. If you hadn’t mentioned that they were black and white wasps, there could be several possibilities. But our only black and white social wasp is the baldfaced hornet. It’s actually a type of yellowjacket, but it’s the only one that is not yellow and black. Baldfaced hornets make those large, football-sized, papery nests that you often see way up high in trees (see What Makes Those Big, Paper Nests in Trees?). 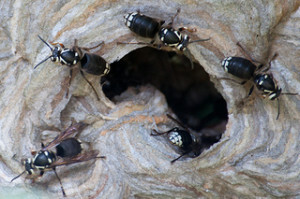 The worker wasps capture insects and spiders to feed to the developing larvae in the nest. They don’t have the same foraging habits as other yellowjackets and so are less likely to interact with people and their food (see Baldfaced Hornets Are Rarely a Problem). Baldfaced hornets are not usually seen in large numbers away from the nest, so it’s surprising that you are seeing “lots” of them. That could mean that they are building a nest in or on your shed instead of up in a tree. That’s uncommon but it does happen. As with all yellowjacket wasps, it’s much easier to control them and eliminate the nest early in the season when it is still relatively small (assuming you can reach it). Because baldfaced hornets usually keep to themselves and because their nests are often inaccessible, we don’t usually recommend any control for them unless their nests are in a place where they might interact with people or pets. You should have a professional exterminator inspect the area and try to locate the nest. If the wasps are indeed nesting in your shed, you will want to have that nest removed. Don’t try to do it yourself. Even though baldfaced hornets are pretty docile, all wasps become aggressive when they feel their nest is being threatened. Give Colonial Pest a call and have one of our pros evaluate your wasp situation.